Dogs are not immune from diseases that can impact their overall health and quality of life. Diabetes is one example of a chronic disease that targets the endocrine system and affects blood sugar levels. Treatment for diabetes includes making diet changes that will help keep those glucose levels as close to normal as possible. Serving your pooch specially formulated dog food that caters to his condition is a step in the right direction when it comes to tackling diabetes. The following diabetic dog food list will help you choose only the best and balanced diet for your dog no matter his age or breed. The first product on our list belongs to Orijen who are experts in the field of dry food. 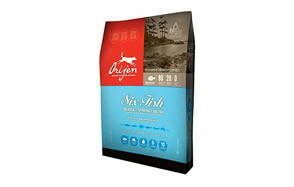 Their Orijen 6 Fish formula has all the key ingredients necessary for a wholesome meal. This prime example of diabetic dog food is grain free and low on carbohydrates. Your pooch can get his daily dose of protein thanks to the wide variety of fish that were sustainably sourced to create this premium dry food. This delicious cocktail of salmon, herring, flounder and whitefish are complemented by freshly picked fruits and vegetables including blueberries, cranberries, carrots and spinach greens. A group of botanical ingredients are also added to the mix in order to support metabolism and detoxify the body. This Origen formula is free from preservatives and is suitable for all dogs no matter their age and breed. Our second pick comes from Wellness Core who offer a grain free formula rich in probiotics and antioxidants. Their turkey and chicken recipe made it to our diabetic dog food list for several reasons, and high protein is one of them. Wellness Core believe in providing premium ingredients free from fillers and artificial preservatives. Their dog food is made with a combination of chicken, turkey as well as fruits and vegetables such as sweet potatoes, apples, parsley and broccoli. Essential vitamins and minerals also elevate the nutritional value of this formula. This dry food is suitable for dogs who are over one year old. 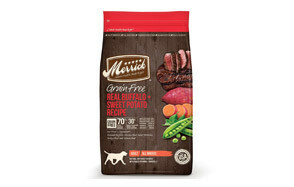 Merrick grain free dry dog food is locally sourced and made with real buffalo and sweet potatoes. Balanced nutrition is essential for diabetic dogs and this formula delivers premium ingredients such as deboned salmon, buffalo and chicken. A combination of fruits and herbs as well as fresh vegetables were also added to this high protein product to create a nutritious meal for your pooch. This Merrick formula is infused with Omega 3 and 6 fatty acids that support his coat and contains glucosamine and chondroitin to help maintain healthy joints. The Nutrisca grain-free dry food from Dogswell is formulated to meet the nutritional needs of your pooch and is made with real salmon and flavorsome chickpeas. The wild caught salmon provides an optimal source of essential amino acids and proteins while minerals add more nutritional value to this formula and make it more palatable. Low glycemic peas and chickpeas are also cornerstones of this recipe and are a great source of protein and fiber. Premium fruits and vegetables such as cranberries, carrots and apricots were also added to the mix as well as vitamins A and E. These antioxidant sources help maintain a healthy immune system. This Dogswell product is gluten free and is made without any added hormones, colors or preservatives. 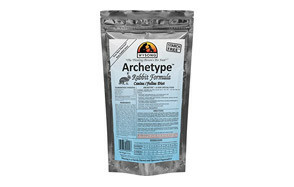 Puppies as well as lactating and pregnant dogs can feast on this quality diabetic dog food for lunch and dinner. The Nutro Lite dry dog food provides complete adult nutrition for your diabetic dog and is made with natural and wholesome ingredients. These ingredients include farm raised chicken and sweet potato. Chicken is the number one protein source with added vitamins and minerals. This premium recipe also includes apples and blueberries as well as peas and whole brown rice. The low-calorie formula is made with non-GMO foods that are sourced from trusted farmers and suppliers. This tailored blend of fiber and protein was created for dogs who are one year of age and older. Royal Canin diabetic dog food formula contains a combination of soluble and insoluble fibers in addition to prebiotics that help stabilize glucose levels. This complete and balanced diet was tailormade for dogs who suffer from diabetes. Moderate fat content makes this Royal Canin product the food of choice for dog owners who are in search of a veterinary diet supplemented with vitamins and minerals. The Wysong Archetype raw food is another quality non- prescription diabetic dog food made with real rabbit meat. Archetype chunks are starch free and made with a variety of ingredients such as organic blueberry, plums and broccoli sprouts. These ingredients are nutritious and free from any harmful additives. They are also complemented by taurine, minerals and the essential vitamins your pooch needs in order to stay healthy. This combination of protein, probiotics and amino acids offer a wealth of benefits for your dog. Acana grasslands is a grain free formula made with five types of meat. Each ingredient is locally sourced and packs a punch when it comes to protein. A combination of grass-fed Kentucky lamb, duck, fresh eggs, quail as well as trout are all used to supply your pooch with his daily dose of nutrients. Apples, pears, collard greens and other freshly sourced fruits and vegetables also provide him with nourishing vitamins and antioxidants. The Instinct Raw Boost grain free recipe allows your pooch to feast on a combination of high protein kibble and freeze-dried raw meat. Real chicken is the number one ingredient followed by a list of other healthy ingredients such as carrots, apples and cranberries. This formula is also made with a fat burning nutrient that promotes healthy metabolism and helps your pooch maintain an ideal weight. The raw chicken is minimally processed and made in small batches to ensure its freshness. Instinct raw boost is suitable for all dog breeds and can be served to young adult and senior dogs. Our final pick comes from Solid Gold who are experts at making holistic dog food. Their recipe is made with cold water salmon that is packed with wholesome protein, and krill meal which is a source of Omega-3 fatty acids. This formula is also enriched with vitamins and minerals in addition to sixteen nutrient dense superfoods in addition to L-Carnitine. All the above features make it one of the best glucose management dog foods on the market. The Solid Gold high protein diet is loaded with healthy fats that contain twice the amount of energy as proteins and carbs to help sustain long energy needs. This moderate calorie recipe is suitable for adults of all sizes and is low on carbohydrates as well. Diet can make a world of difference when it comes to your pooch and knowing how to manage his diabetes can turn things around and improve his quality of life in the long run. 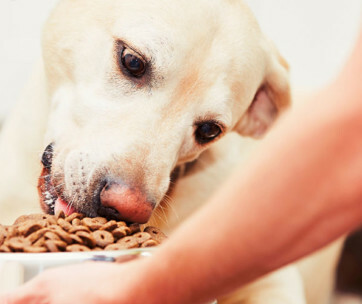 The following guide will help you choose the right diabetic food for your dog and will also answer some frequently answered questions regarding this disease. The word wholesome is synonymous with a nutritious and balanced diet. The above list offers many examples of foods that contain the key ingredients needed for weight maintenance and keeping blood sugar levels under control. Protein is the foundation of every wholesome diet and this protein needs to be the number one ingredient on the list. Buffalo meat as well as salmon and chicken are three examples of protein sources that provide your pooch with his daily dose of energy. You will also find meat meals written on the package and those are dehydrated meats that had their water and fat removed. Read the ingredient list carefully and keep an eye out for additives and artificial preservatives. These preservatives have complex names and can be easy to spot if you happen to come across low grade kibble. The best food for diabetic dogs is typically a natural brown color and free from artificial colorings. There is no shortage of fruits and vegetables in the above list of diabetic dog food. Apples, cranberries, pears and a wide array of vegetables are found in several balanced diets due to the many health benefits they bring to the table. Many fruits are loaded with antioxidants and are also a low-calorie source of vitamins and fibers. There are so many reasons why fiber is essential in this kind of diet. Fiber helps your dog consume less food since he will feel full after finishing his meal. This is because fiber takes longer to digest and slows absorption. Eating fiber also allows glucose to enter the bloodstream slowly. Slow absorption results in a more stable blood glucose level over time. Most premium diabetic foods are made with fiber-rich ingredients such as sweet potatoes and pumpkin and a wide array of nutrient rich veggies. A small amount of fat is essential in any balanced diet. Consuming fats allows the body to absorb vitamins. Omega-3 and Omega-6 fatty acids found in salmon and flaxseed keep your dog’s coat looking shiny and healthy. These polyunsaturated fats can be found in the list of ingredients written on the back of quality kibble. Fat is high in calories and therefore added in small quantities in diabetic formulas. Fats also have higher glucose levels and consuming a diet rich in fats will only contribute to weight gain and further complications down the line. There are two kinds of carbohydrates: simple and complex. Simple carbs include corn and soy and are far from healthy for your diabetic pooch. 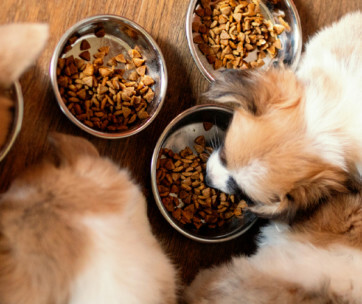 These carbs are usually used as fillers in low quality kibble and contain a high percentage of sugar that the body processes rapidly once your dog finishes his meal. Complex carbs are packed with vitamins and essential nutrients and those can be found in quality diabetic recipes in the form of peas and sweet potatoes as well as many other fruits and vegetables. These carbs are added in small quantities to avoid causing sugar spikes in the blood and are listed as secondary ingredients rather than main ones like protein. There are many simple guidelines that you can follow to help your dog cope better with this disease. If your pooch suffers from Type 1 diabetes, then feeding him a high fiber diet is recommended. This diet needs to be low in simple sugars to help keep his blood sugar levels under control during the day. Consistency is key here and this can be achieved by feeding him prescription foods that follow certain guidelines and deliver the same quality product every single time. Consistency is also recommended when it comes to feeding times. Your pooch needs to be fed every twelve hours the same quantity of food daily. Commercial diets are also a suitable alternative to prescription foods, especially if your dog is a finicky eater. Premium kibble formulated for weight management is a great option since its formula is low in simple sugars and high in fiber. 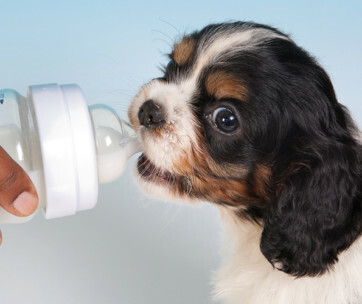 Dogs who require insulin injections should receive their insulin dose after their meal. 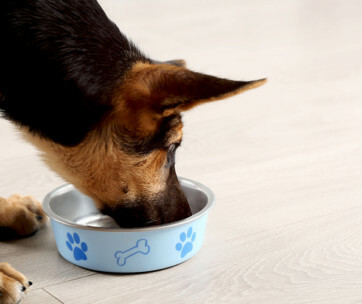 Administering a low dose is recommended if your dog did not finish his food and ate a smaller portion than usual. Establishing a vet recommended routine can make a world of difference to your dog. This routine or diet plan can be carefully designed with your dog’s needs in mind. 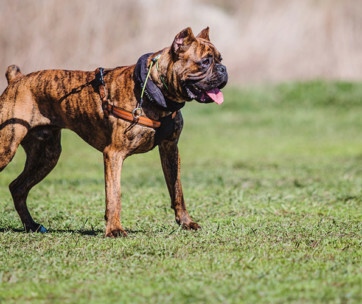 Exercise is also another important component when it comes to managing canine diabetes. It helps your pooch stay in shape and gives him an outlet for his energy. However, too much of a good thing can hurt your diabetic dog. Strenuous exercise causes the body to use up more glucose and your pooch will have extremely low blood sugar levels as result. Therefore, you need to consult your vet before taking your dog on a hike or enrolling him in agility exercises. Feeding your pooch a balanced diet is only one part of the diabetes management equation. The other part involves checking his glucose levels on a regular basis. Checking those glucose levels is possible at home or at the vet. If you already have a portable glucometer and blood test strips. You can proceed to monitor his glucose at home. Urine can also be tested for both glucose and ketones. The latter is a chemical produced by the body when it burns fat for energy. Running blood tests is more accurate when it comes to measuring glucose, but urine tests can be easily done at home. Helping your pooch maintain an ideal weight will also keep his condition stable with less fluctuations when it comes to his blood glucose levels. Obese dogs who suffer from type 2 diabetes should be fed 2/3 of the recommended daily allowance of a vet recommended diet until they finally reach their ideal rate. This ideal weight depends on your diabetic dog and his own health condition and age. Coming up with a comprehensive health plan with your vet will make a world of difference to your pooch in the long run. Cooking up delicious homemade meals for your pooch is possible just if you stick to certain rules. These rules have everything to do with the way the body processes energy and the ingredients used in making these meals. Your recipes need to be consistent and they need to deliver the same nutritional value every single time. They should also be low in simple sugars and made without sweet ingredients. Controlling sugar intake is the goal here and homemade food can help you achieve this. Your recipes should also include ingredients that contain complex carbohydrates. Carb sources include brown rice and oats in addition to vegetables like sweet potatoes and carrots. Fiber is one more component worth mentioning and can be added to your recipe to help your obese pooch lose weight. Small amounts of premium meat are also an important ingredient in homemade diets. Small portions of fruits and vegetables make great treats for diabetic dogs. Fiber found in fruits helps keep blood sugar stable and vegetables are low in calories as well. Apples, blueberries and raspberries are all examples of healthy treats that should be fed in moderation. Spinach, cucumbers and green beans are also recommended. If you happen to be cooking broccoli for lunch, you can steam it before feeding it to your pooch as a treat. Lean meats also a good choice for treats but make sure to read their calorie content before buying them. You can take advantage of your pooch’s kibble and transform it into a treat. All you need to do is add low sodium chicken broth to his food before baking it in the oven. Treats should not be fed randomly throughout the day. This can cause blood sugar spikes. The ideal time for doggie treats is 4 to 6 hours after their insulin injection. Giving your pooch too many treats is not recommended even if they are low in calories. These calories will eventually add up. Commercial doggie treats are available everywhere and some of them are specially formulated for diabetic dogs. Reading the key ingredients written on the back of the package is always recommended just in case you come across an unsavory ingredient. Corn and soy are both examples of unhealthy foods that are packed with sugar and used as fillers in some commercial treats. Fructose, molasses and corn syrup also fall under the same umbrella. A: Diabetic dog food is formulated to meet the needs of dogs who suffer from this disease. Therefore, it contains high protein meats and is low in fat and made with restricted amounts of carbohydrates. Fiber rich ingredients are also found in this type of diet in addition to low glycemic fruits and vegetables such as apples and carrots. All the above components are supplemented by a selection of vitamins and minerals as well as fatty acids. Protein should account for at least 30% to 40% of the calories found in this diabetic diet. Fats and carbs should be responsible for providing only 30%. Q: How much fiber should a diabetic dog consume? A: Most diabetic dogs can consume moderate amounts of fiber. Dietary fiber is available in two forms: insoluble and soluble. Insoluble fiber can help with glucose control while soluble fiber slows down the digestion rate of nutrients including carbohydrates. This means less spikes in blood sugar and low-fat absorption as well. Increasing or decreasing the amount of fiber depends on your pooch, his age and health condition. 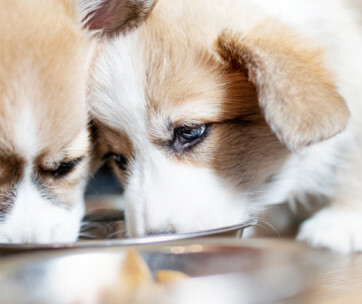 Dogs who suffer from poor glycemic control may benefit from increased fiber while others who are underweight are better off consuming small quantities of fiber. Q: Should I give insulin to my diabetic dog? A: Keeping blood glucose under control is done by administering insulin injections. These injections are given twice a day. Your vet can teach you how to give those injections in a safe and efficient manner. Q: What is the expected life span for a diabetic pet? A: The life span of a diabetic dog depends on many factors. The sooner your dog is diagnosed, the better. Constantly monitoring your pooch and keeping his blood levels under control is a step in the right direction. This coupled with a specially formulated diet and making the necessary lifestyle changes will hopefully allow him to live a full life. Diabetes is far from a death sentence for your pooch and you need to keep this in mind once he is diagnosed with this disease. Our top pick combines all the necessary ingredients needed for a well-balanced diabetic diet. This wholesome product is packed with fresh and delicious fish and a healthy combination of freshly picked fruits and vegetables. This premium formula is made from sustainably sourced foods that are free from grains and low on carbohydrates. Botanical ingredients are also added to the mix to provide a nutrient dense dry food with plenty to offer your pet no matter his age, size or breed.